I am grateful for students and employees who are passionate and committed to both protecting natural resources and looking out for people who are vulnerable to environmental degradation in their communities. St. Stephen’s and St. Agnes School puts faith into action in its care of the home shared by all people — the Earth. Protection of the Earth is vital to ensure that all people are able to live healthy and productive lives. The Episcopal Church has called upon us to care for our planet and safeguard communities vulnerable to climate change. As stewards of God’s creation, we aim to protect the resources entrusted to us so that they remain available to all people of the Earth through our Environmental Stewardship Program, which is firmly rooted in our school culture and strongly linked to faith. Saints strive to reduce their impact on the planet in their daily lives as well as through their long-term goals. 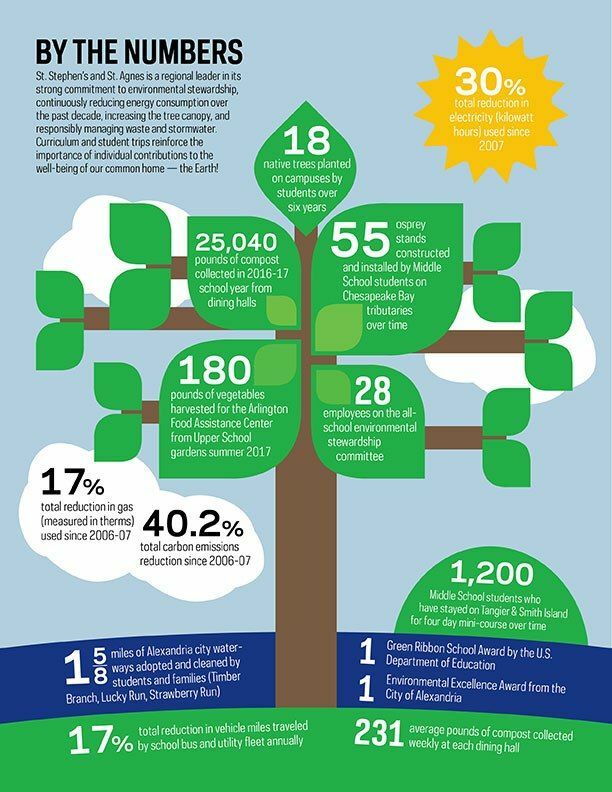 Since 2007 overall carbon emissions have been reduced by 40 percent across our campuses. In 2016 the Middle School was selected as a U.S. Department of Education Green Ribbon School, a national environmental award presented to schools. Additionally, the school was honored to receive the Ellen Pickering Environmental Excellence Award from the City of Alexandria. Teaching focuses on watershed, woodland, and habitat protection; resource conservation; and renewable and conventional energy in the classroom and in the field. The school currently monitors its energy use through an energy dashboard and annual audits, and is pursuing alternative energy sources for its buildings. Planting native trees, vegetables, and pollinator plants provides a diverse range of species on our campuses and cleans stormwater runoff. Students grow food for local food banks and regularly clear litter from three waterways in Alexandria City. Carpooling and use of free campus shuttles reduces emissions. We also have a no idling policy in carpool lines. Students learn about national and global communities and the underlying need for safe and clean natural resources for their ability to thrive. Composting, recycling, and reusing reduces solid waste. Saints compost nearly 30,000 pounds of food waste annually. An energy dashboard compares building electricity and gas consumption over time so that the community recognizes its energy reduction progress. The week focuses on individual and collective practices related to waste, energy, and transportation. Assemblies, activities, competitions, and plantings occur. Additionally, families participate in several at-home activities. Campus initiatives include composting in all dining halls and single-stream recycling as well as reuse initiatives. To assist in regional watershed protection goals, community volunteers clean three streams in the City of Alexandria on a seasonal basis. The Middle and Upper Schools also adopted roadways to prevent contaminating adjacent streams. This club engages students in understanding of the choices made by each individual and students serve as peer educators. Science classes grow seedlings for campus gardens and study botany and horticulture. Vegetable, flower, and herb seedlings are then planted In our campus gardens that grow food for area food banks. Three bee hives find their home at a quiet corner of the Lower School campus. Our Creation Trail connects natural features on campus in a prayerful journey and is accessible via a system of QR codes. The gardens tended by Lower School students attract pollinators and feature plants native to the Potomac valley. Students discover and problem-solving using natural materials collected from the campus, including seating logs and bamboo posts. The Lower School is home to notable trees, shrubs and perennials. Please visit our plant map, to learn more. The environmental club promotes practices to reduce waste, encourage recycling, and to protect endangered species. This leadership group guides students in best practices and thoughtful conversation about environmental protection in school and in the community. The organic garden and native plant gardens provide active and contemplative spaces for students. Vegetables are donated to a food bank. The Upper School WeatherBug weather station measures temperature, wind speed, precipitation, radar, and history.